Home » New publications » An Arts and Crafts Window by Clayton & Bell? An Arts and Crafts Window by Clayton & Bell? Over the last few months I have been collaborating on a book about the stained glass at the Church of St Peter, Lampeter. The initiative for the book came from John Hammond, an expert on stained glass war memorials, and we have written the book together, with publication funded by the church. 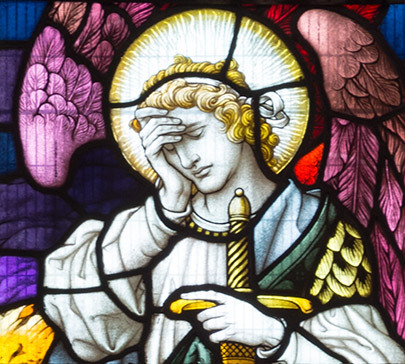 The difference between writing an overview of stained glass in churches and writing a guide that includes all of the windows in the church is that all of the windows need some attention, whether good or bad, and whether or not it is possible to attribute them. In the case of this church, only a few of the windows have signatures, and while the style of some other makers are clear, or have been identified from archives, a handful remained unattributed. The church does contain a really fine window. The west window is the last monumental work by Wilhelmina Geddes, and the recent biography of the artist by Nicola Gordon Bowe is so detailed that it makes the window perhaps the most comprehensively documented stained glass window in Wales. Since the window contains a figure of the patron of the church, St Peter, it is featured on the cover. This was the last window added to the church, but the first were windows by Daniel Bell working with Richard Almond in 1870, and also a window that I considered to be by Lavers & Barraud of the same date. Exactly how many of these 1870s windows were also by Daniel Bell (and Richard Almond, with whom he worked until 1875) was uncertain, and given the fact that relatively few windows attributed to Daniel Bell (brother to the better known Alfred Bell) have been published, it has been difficult to make comparisons with other windows by the artist. Another window that I was particularly keen to attribute was an attractive First World War memorial. The window is more colourful than much contemporary stained glass, and exhibited unusually loose glass painting in a few areas of the background. The window had no makers’ mark that we were able to discern, and we did our best to go through all of the church and diocesan archives that might be able to date or identify the maker of the window. These efforts failed to find even the date of the window, and I thought that I ought to consult a few experts that I knew in case any suggested attributions came to light. After a couple of conversations by email, I was at least approaching the idea that the window was not the work of an individual artist associated with the Arts and Crafts Movement, but was more likely to be by a larger studio, even if it was a livelier window than the usual output of the period. This was then corroborated by a suggestion from Neil Moat that it was the work of John Clement Bell for Clayton & Bell. Given the character of the other windows that I knew of by the firm from around the time of the First World War, this window was something quite different, and unlike anything else that I could find by the firm published online or in print – not that our libraries are full of illustrations of twentieth-century Clayton & Bell windows. The only other vaguely comparable window by the firm that I knew of was at Beaumaris: a colourful five-light Crucifixion scene. There wasn’t quite the same freshness of colour and painting here, and the painting of the faces was rather different to that in the Lampeter window. 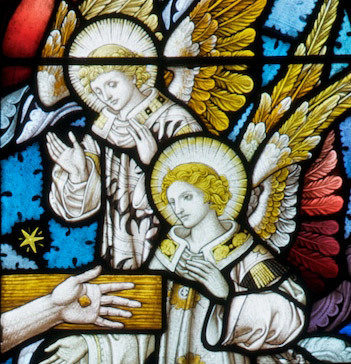 However, when I looked at the painting of the angels above, there did seem to be a greater correspondence with the the faces in the Lampeter window. Surely there was a second glass painter at work here in the Beaumaris window (probably more of course). But the most startling similarity between the two windows was a very tiny detail. Many Clayton & Bell windows, going back well into the nineteenth century, feature little stars that are nonetheless prominent in the design. 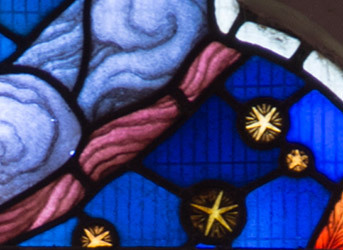 These two windows also had little stars in the upper parts of the window, and are remarkably similar in execution. Was the principal glass painter of the Lampeter war memorial working at Clayton & Bell’s studio when he or she painted it? Can we identify the influence of the Arts and Crafts aesthetic (a controversial idea, let alone a definable one) in the output of Clayton & Bell in the 1910s or 20s? Are there many more windows by Clayton & Bell of the period that remain unidentified because of their dissimilarity to what we expect their windows to look like? 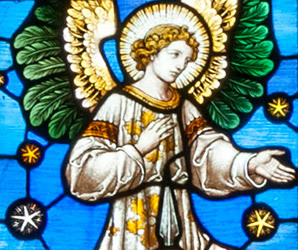 The answers to such questions are known by the very few people who have in-depth knowledge of British twentieth-century ecclesiastical stained glass. And it is with sadness that I have to record that in the time since I corresponded with Neil Moat he died suddenly, so now there is now one fewer. By martin in New publications, New research on March 7, 2017 . Have you any close up shots of the window so I can compare the style and colours more closely with windows I know? On the face of it the stars, hair, treatment of the feathers look CB. It would be interesting to see the style of the dedication lettering. There are some windows at Gilling West in Yorkshire signed CB 1915. The “rainbow angel wings” seem to be a CB thing. I have added a few details of the window on the Stained Glass in Wales catalogue this morning which may help. The inscription at the bottom is unlike anything else I have seen by Clayton & Bell.